Since you always aced your social studies courses you already know the President needs 270 electoral votes out of the 538 up for grabs. The winner can lose darn near forty small states, win the most heavily populated ten plus, and be the first to tag the bible on January 20, 2013. Show the above map to grade schoolers and ask who is likely to win. They’ll say the Red Team. 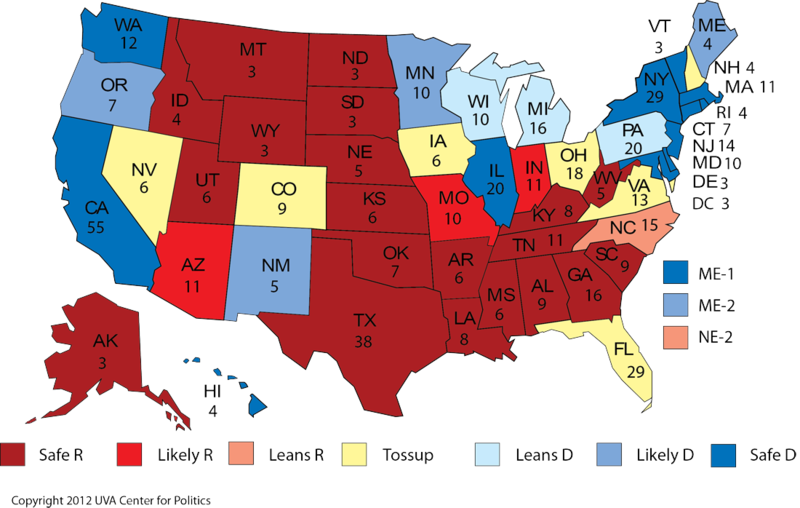 Even though you understand how the Electoral College works, you probably don’t know why some states tip blue and others red. That’s what I’m here for. It all starts with cool ocean breezes in the Pacific, upper Atlantic, and Great Lakes region. Those cool breezes translate into more moderate temperatures especially on the West Coast and in the upper Northeast. In contrast, the great, red, middle swath of the country is mired in hot and humid summers and killer cold winters almost all the time. Ocean and Great Lake breezes and cool temps contribute to blood flow, heightened brain activity, and altogether clearer thinking. Sadly, over time, people living in the great, red, middle swath of the country develop cognitive deficits as a result of oppressive heat and humidity and dramatic temperature swings. The technical term for this is Climatic Induced Cognitive Deficit Disorder or CICDD. Also, until the last presidential election, very few people knew that on clear days you can actually see Russia from the West Coast of the U.S. That proximity to Russia—coupled with shared suffering during earthquakes, mud slides, and forest fires—explains the more collectivist mindset of Left Coasters. Then there’s dietary considerations. Reds don’t just like their heat, humidity, and bugs, they like breaded and fried meat casserole-based potlucks more specifically. All washed down with whole milk. Blues prefer roasted vegetables, fresh fruit, and wine. That explains the dramatic physical health divide, which like the climatological differences, translates into a mental health chasm. Eat well, be well, think well. Then there’s preferred outdoor activities. This time of year Blues hike among trees and meditate silently upon their changing colors all while looking forward to snow shoeing and cross country skiing. Reds hike among trees too, in search of large defenseless animals to shoot and kill. Then they drag them home, bread them, and fry them. All while looking forward to firing up their snowmobiles and making lots of noise and pollution. Blue outdoor activities lead to enlightenment. Red to blight and lunacy. Then there’s different artistic sensibilities. Blues prefer classical music, independent and foreign films, modern dance, national public radio, and The New Yorker. Reds, country and heavy metal, Arnold Schwarzenegger films, reality television, Fox News, and The Washington Times. Heightened enlightenment and even greater lunacy. This entry was posted in Social Sciences and tagged Barack Obama, conservative republican, electoral college, liberalism, Mitt Romney, partisan politics, Politics, presidential election, taxes by Ron Byrnes. Bookmark the permalink.